Ah, ah, ah! Velcome, fellow creatures of the night! It is I, Fred the Mole...or should I say, Dead the Troll!! It's October, my fiendish assistant, which means Halloween is just around the corner...and so am I! Sleep vell! How-woooooool! Sigh, sorry gang, but this just isn't working. It's hard to convey Halloween excitement online. I'm really sorry for attempting it. Tell you the truth, I don't even know what character I was doing. Was I trying to be Dracula, a werewolf, the Crypt Keeper, or Svengoolie?? Anyway, I've always loved Halloween. When else do you get to play dress-up and pretend to be something that you're not...that is, aside from whenever you're on vacation at a ranch in Texas with a news crew following you around? 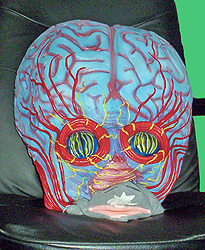 This year I'm going trick-or-treating as my favorite movie monster, the Metaluna Mutant from This Island Earth. I'm even working on what I'm going to say. "Hello, I am a Mutant. I am much like the insects you have here on Earth, but larger of course and with a higher degree of intelligence." Yeah, that'll get 'em! I'll work on my mannerisms later. In the meantime, we've got some scary stuff to discuss...ah, ah, ahhhh! As I was admiring myself in the mirror in my new costume, I was reminded of how easily the Metaluna Mutant was defeated in This Island Earth. Pretty much he was continually bashed in the inexplicably exposed brain and was then crushed to death by space pressure. That made me wonder how easy it would be to do away with some other "menacing" movie monsters. I mean, really, what's the big deal? Why are people so terrified of them? These big, lumbering lunkheads wouldn't last five minutes in reality. 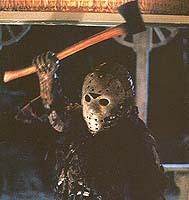 Jason Voorhees (Friday the 13th Part 2-on) - At first I thought the best way to stop Jason would be to simply freeze the lake. Camp Crystal Lake is somewhere in the eastern United States, depending on which entry of the series you're watching, so it would be quite easy to keep the lake perpetually chilled year-round. The guy's a zombie, not Superman, so it's not like he'd be able to break free very easily. But then I realized that Crystal Lake probably has frozen over at various times over the years--like I said, it's probably somewhere in the New English area--and that doesn't seem to affect Jason too much after it's thawed. Then I found the answer! Jason keeps coming back and starts killing teens because he's always left alone and intact whenever he's been defeated in the previous movie. That can easily be fixed: cut him up and incinerate the pieces. That may seem a bit extravagant to some, but remember we're talking about an undead serial killer here. Or heck, you don't even need to burn the whole body. Just lop off the arms and get rid of them. I guarantee that this simple-minded mama's boy won't pose too much of a threat if he can't wield a weapon. He's not the Black Knight from Monty Python and the Holy Grail, for cryin' out loud. And if you're about to speak one word of the traveling Jason "spirit" thing from Jason Goes to Hell, then you are asking for a kick in the groin. Count Dracula (Dracula) - You're kidding, right? Kill him in the daytime! Go to his castle at eleven in the morning, open up his coffin, drag him out and put him in front of a window, and blammo! Why do the heroes in vampire movies always wait to have the big final showdown at night?? Michael Myers (Halloween) - Tell him that Dana Carvey deserved top billing. Whoops, wrong guy. Well, if the nine hundred DVD editions of the first movie are all correct, we're dealing with a grown man with the mentality of a brooding young adult, so probably the best way to get rid of this dork would be to make sure the news is on all the TV sets, with no way of changing it to G4 or Adult Swim. Or, if you're on the move, make sure your iPod or Walkman is playing nothing but Rod Stewart. It's as good as garlic. Or, if you want to instead keep him distracted for extended periods of time, send him a five thousand dollar gift card for Hot Topic. Zombies (Night of the Living Dead) - Organize an anti-abortion rally at the nearest Planned Parenthood location. Oh sorry, wrong kind of mindless zombies. Frankenstein's Monster (Frankenstein) - Gee, if only he was afraid of a basic elemental compound that could be used to...you know...burn him. Chucky (Child's Play) - Oh no, it's eighteen inches of terror! Aaaaiiiggh!!! Sheesh, after you've locked him into a dog crate, sell him on eBay and make sure you use Priority Mail to ship him out. I promise you nobody would ever see him again. I would rather meet someone who feels compelled to explain the premise of the rival NBC drama Kidnapped. The Wolfman (The Wolf Man) - Jar of fleas, period. "This stuff really works!" 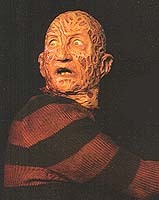 Freddy Krueger (A Nightmare on Elm Street) - How does one ward off a killer who invades dreams? After all, anything can happen in a dream. The guy can stretch his arms and form different shapes like Plastic Man, yet he always seems to need a sweater. Hmm. Anyway, Freddy also has a thing for killing children, which obviously explains why he's such a beloved cinema icon (after all, he was a product of the Reagan era). So we're clearly dealing with a very cowardly person here, one who needs to prey on kids and sleeping teenagers to feel empowerment. It probably wouldn't take too much to scare him away from your dreams, so make sure you suppress enough bizarre thoughts and desires into your subconscious so that your dreams are well populated with vile, repulsive individuals. Trust me, Freddy would be caught completely off-guard as soon as he bumps into Ann Coulter, Michael Jackson, or a scientologist. George W. Bush (Fahrenheit 9/11) - Well, the best way to defeat Bush is simple: On November 7, give the Democrats control of the House and Senate! Ah, Jamie Lee Curtis. How does one not love you? Funny, pretty, tough, and smart. If you were about four-and-a-half feet shorter, were completely covered in grayish brown fur, and were a sow instead of a human, I would sooo have the hots for you! Needless to say, the horror genre owes a huge debt of gratitude to Baroness Haden-Guest here. She is easily slasher movies' most famous and most recognizable protagonist, elevating herself to a position higher than that of the normal bubbleheaded, bouncing, nameless damsels in distress that one often sees on the screen. She was proud of her "scream queen" heritage, even long after she had established herself as a "mainstream" actress. Jamie also helped spark one of horror's most overlooked trends, in which a young female ingenue teams up with a veteran character actor or actress of some acclaim. Why the older actor ends up in such a movie to play the killer or the helper or the authority figure is often a mystery. Perhaps they owed a favor to one of the producers? Perhaps they needed some quick dough? Or perhaps their agent convinced them that it was a good way to get their face out there to youngsters? Who knows. Regardless, it became quite an enjoyable, if not always effective, tradition in horror movies. So if not for Jamie and Donald Pleasence in Halloween we would never have been treated to Jamie and Leslie Nielsen in Prom Night, or Jamie and Janet Leigh (or Hal Holbrook, if you prefer) in The Fog, or Jocelyn Jones and Chuck Connors in Tourist Trap, or Carol Kane and Charles Durning in When a Stranger Calls (the good one), or Adrienne King and Betsy Palmer in Friday the 13th, or Nancy Allen and Michael Caine in Dressed to Kill, or even Melissa Sue Anderson and Glenn Ford in Happy Birthday to Me. And we'll be kind and forget other early '80s slasher stinkers like Death Valley, Don't Go in the House, and the severely overrated Maniac. Terror Train follows the same pattern as before, this time with Jamie paired off with none other than Ben Johnson. Unfortunately there really isn't much else one can say about this slightly laughable, paint-by-numbers slasher flick. 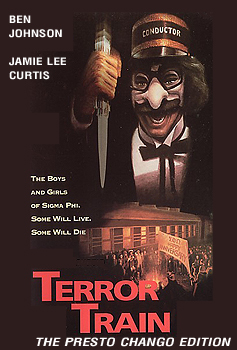 A killer has infiltrated a train-based college costume party (which were all the rage in 1980), allowing them to show up as either Groucho Marx (that is, if he was designed as a Spitting Image puppet), a Godzilla knock-off, and other creepily cheap guises. Oh, and there's magic too for some reason, with the legendary David Copperfield showing up to make us question his better judgment more than it has ever been questioned before. But it's got Jamie Lee Curtis, not to mention Ben Johnson, so that's something. Long live the scream queen. The Gama News Team ©2006 GAMA Productions. The Gama News Team, Fred the Mole, and related characters are the exclusive properties of GAMA Productions. All rights reserved.